This essay will appear in 2015 in a book reviewing the work of artist Wojciech Bruszewski. In 1982 Wojciech Bruszewski compiled a number of experiments with sound that he had been making since 1976 in a short VHS compilation called ‘A Little Music’ (‘Trochę Muzyki’). Short films like ‘TV Music’ (1979), ‘Sternmusic’ (1979) and ‘Behaviour Music’ (1982) documented the improvised instruments which Bruszewski had made that converted images into sounds or notes which could change pitch and dynamics, and featured rhythmic effects. Described by Bruszewski as musical works, they were, however, indifferent to the conventions of artistry and personal expression on which music has relied for most of its history. Rather, these works – many produced using hacked electronic devices like televisions and video cameras – set out to explore the ‘gap’ between sound and image. The fundamental scandal of sound film … is that sound and image are different phenomena, recorded by different methods, printed many frames apart on the film, and reproduced by an illusionistic technology. Voices are uttered by cardboard cones, by mechanical instruments, by machines designed to meet the challenge of a world in which cities are too populous to be addressed by a single unaided human voice. Cinema’s ventriloquism is the product of an effort to overcome the sound-image gap, to mask the sound’s technological origin, and to permit the film’s production personnel to speak their sub-conscious mind – their belly – without fear of discovery. In ‘Yyaa’, Bruszewski filmed himself in a room in which the lights were switched on and off: occasionally, the image cuts to a close-up before switching back to a wide-view. Lighter, darker, closer, further … these edits provide a rhythm for the soundtrack, a seemingly unceasing scream: when the scene darkens, the pitch of Bruszewski’s scream alters; and when the camera closes in, the pitch changes again. Five minutes in duration, it soon becomes clear to the viewer that this is not an endurance test (in the manner, perhaps, of Marina Abramovic’s 45 minute attempt to exhaust her vocal chords, ‘Freeing the Voice’, performed in Copenhagen in 1975): Bruszewski’s long scream was in fact spliced together from a series of recordings. ‘Yyaa’ announced Bruszewski’s anti-humanism and anti-naturalism through an act of ventriloquism. It takes what is often understood to be the most ‘authentic’ forms of human expression, the howl, (which, as Altman says, seems to be the product of the sub-conscious mind or even the belly) and renders it strange. In ‘Yyaa’ the voice seems to be separate from the body, less a human capacity than a thing. Similarly, in ‘Time Structure’ of 1977, Bruszewski filmed a stop watch over three minutes. Whilst its long hand counts the seconds, an electronic pulse can be heard. After half a minute the pulse slows, and so, it seems, does the long hand. This was an illusion of synchrony created in the mind: the rhythm of the stop watch was unaltered. Bruszewski was, in effect, conducting a visual experiment into ‘the ventriloquist effect’ – a phenomenon first investigated by research psychologists Ian Howard and W.B. Templeton in the 1960s – which demonstrated that when a viewer is presented with images and sounds which might possibly be construed as sharing the same source (like movement of the hand and the tick of Bruszewski’s stopwatch), they assume it must be so. In other words, sounds seem to have the capacity to change our perception of images. WHAT EXISTS – exists outside me. WHAT EXISTS is knowledge of what exists. The knowledge exists from cultural pressure. What I do in film, video or in the area of other techniques consists in nothing more than laying traps for WHAT EXISTS (1, 2). Bruszewski was particularly scathing of the existential, humanist currents flowing through Polish art. Writing in Warsztaty Formy Filmowej (August 1975), the group’s periodical, he attacked the ‘tendency of poetic involvement in art, or, defining another aspect: emotional and expressive: focused on the expression of an artist’s inner emotions, his ‘anxiety’; happily using any uncontrolled – and therefore ‘authentic’ – impulses as a means of expression (hence the favorite criterion of ‘truth’).’ Similarly art critics were equally blinded by their humanist mindset: They effectively replace knowledge with sensibility.) By contrast, Bruszewski and his Workshop of the Film Form allies saw themselves as being engaged in a rigorous examination of the film medium and the apparatus of human perception. What then are we to make of the works which Bruszewski declared to be music in the late 1970s? What kind of conception of music did they offer? Or might the designation be one of his ‘traps’? In ‘TV Music’ (1979) Bruszewski added sensors to the surface of a conventional television. Each converted light into to sound played through a speaker. When the light intensity changed on the screen, the pitch of the note altered too. Three sensors produced something like a chord although the harmonic relations of these changing notes was changing and arbitrary. One way of interpreting ‘TV Music’ was to see the broadcast image – news reports and feature films – as a kind of score which is generating an indeterminate piece of music by chance, a long-standing preoccupation of experimental composers like John Cage. The stochastic qualities of TV Music (and other ‘A Little Music’ works) mark a key difference with the dispassionate experiments like ‘Yyaa’ made in the early years of the Workshop of the Film Form. ‘TV Music’ restores a kind of synchrony which his first explorations into the sound-image gap had opened up. In a recording documenting ‘TV Music’, Bruszewski’s television plays a melodramatic period drama – perhaps set in the Middle Ages. A woman is abducted, her scream muffled by her assailant’s hand. Nevertheless, men nearby are alerted by the commotion and rush to her defence. A loud fight ensues, in which the attacker is thrown headfirst – in the Hollywood cliché – along a long table set with pewter dishes. Conventionally, synchronized effects like screams and fights like these are enhanced by foley and voice artists, who provide sounds which are added to the image in post-production. Music too is usually an after effect. They are added to heighten the emotional ‘depth’ of the film (or, as Altman put it, to allow the ‘production personnel to speak their sub-conscious mind’). Although direct sound recording brought a kind of gritty authenticity to film in the 1960s, romantic and horror movies still called on the foley artist’s skills long after. In ‘TV Music’ this symphony of illusions is switched off, literally: instead, Bruszewski’s sensors, fixed onto the screen with trailing wires and stimulated by light, deliver a new soundscape. This is a real time synthesis of sound and image. Wolff’s characterization shares much with the anti-literary ethos of the Workshop of the Film Form. Whether the group’s films, Bruszewski’s ‘A Little Music’ works, or in fact, any form of experimental music, could slough off expression, drama and psychology is, however, up to judgment. Much depends on the context of their making and reception – here ‘TV Music’s’ engagement with broadcasting and television is perhaps rather more important than its claims on music. Mr. Paik takes a huge horse-shoe magnet straining under its weight. He places it on top of the television set. The original image is completely destroyed and turned into unique electronic shapes. He turns on an electromagnet. Bzzzzz! The shapes dance. Here and there a disembodied hand is visible, a vestige of the original programme. Paik’s artworks and his Paik/Abe video synthesizer (created with television technician Shuya Abe in 1969-71) were widely interpreted in the US in the 1970s not just a way of making trippy images though this was part of their appeal. They were also taken as an invitation to interrupt the one-way flow of television from the corporation to the viewer. ‘In its present form,’ wrote Hans Magnus Enzensberger in 1970, ‘equipment like television or film does not serve communication but prevents it. It allows no reciprocal action between transmitter and receiver; technically speaking it reduces feedback to the lowest point compatible with the system.’ New portable video cameras like the Sony Portapak and cable television were imagined by the Counter Culture as a way of breaking the hold of the corporations on the airwaves and the means to produce ‘Guerilla TV’ or what Paik called ‘Participation TV’. Clearly circumstances in the Peoples Republic of Poland (PRL) were very different. Yet members of the Workshop of the Film Form – Bruszewski amongst them – took a keen interest in the operations of television and negotiated access to video technology owned by state media institutions. In 1974 the Workshop of the Film Form was both the subject and the author of a programme broadcast on the second Polish channel, TVP2. In his contribution to the broadcast, ‘Spatial Transmission’, Bruszewski circled the studio on a bike within the field of vision of three cameras. One tracked his movement whilst the other two held fixed viewing points. Split screen, and featuring both Bruszewski and the camera monitors, the result is a looping image. ‘I wanted to make the film structure close to the chaotic, labyrinthine structure of life which we have to live whilst participating in the show called the world’ he said in a voice over which introduces the film. Although faint echoes of the Counter Culture’s avowal of participation and disdain for spectacular illusions can be heard in Bruszewski’s words, the democratization of TV in Poland in the 1970s was little more than a dream. Occupying a central place in Gierek’s modernization programme, TV was state property. Satellite communications and colour broadcasting (after 1971) and the affordability of TV sets did much to polish the image of state socialism. Although Bruszewski and the other members of the Workshop of the Film Form had access to professional equipment and high quality film stock, most of his musical works are effectively ‘hacks’, adaptations and modifications of existing communication technologies. 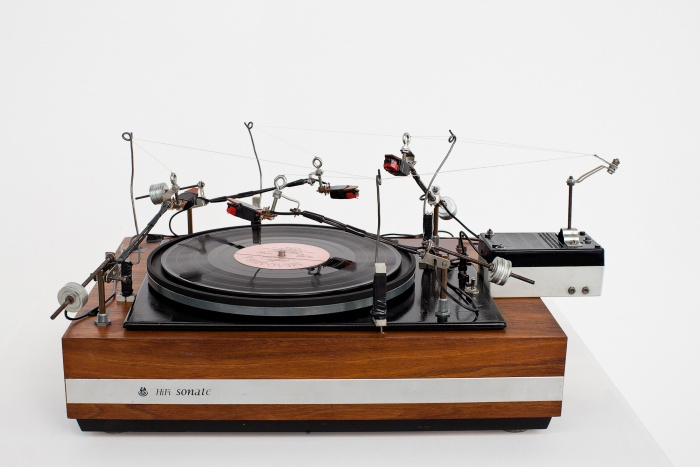 In 1981 Bruszewski created a remarkable device for the 9th Kraków Encounters exhibition, ‘The Gramophone’. This was Bruszewski’s own description, written some years later: ‘My GRAMOPHONE has 4 arms, 4 acoustic amplifiers and 4 loudspeakers. Each arm (each “needle”) plays independently of the remaining ones. If I remember correctly … my GRAMOPHONE played a record with the poetry by Norwid … Best results: Pablo Casals.’ In this way, the insistent linearity of Bach’s melodic lines and the romantic poet’s verses are disturbed by repetition and unpredictable forms of synchrony. ‘Sternmusic’ (1979) was another hack which turned an issue of the German news magazine into a score for a musical composition. This is Bruszewski’s own description: ‘Installation – a sound object using a specially made camera. The camera processes image into a stereo sound. Pointed at the magazine Der Stern, during the turning of the pages, it synchronously processes visual information of the subsequent pages into music.’ The turn of the page introduces a rhythmic effect as the wailing chords formed by the visual data on one spread, modulate under the influence of another. The ‘reader’ of the magazine is compelled to stand between two large loudspeakers fixed to the wall. In tone, the sound generated by this arrangement is unmistakably like a wailing alarm sounded at times of crisis. Using the same camera device which he had created to make ‘Sternmusic’ installation in 1979, Bruszewski turned the lens on himself in ‘Behaviour Music’ (1982). Standing before the camera and in a bright spotlight, the artist – wearing dark sunglasses and dressed in black – moved erratically, his movements triggering different sonic effects. In the video footage documenting the performance – made by the same acoustic camera instrument – the music sounds like numerous wailing sirens shifting pitch like an alert as Bruszewski twisted his body or moved his arms. Notwithstanding Bruszewski’s rejection of symbolism and expression, it is hard not to associate the sounds with the conditions of Martial Law which had been imposed by the state on the country when he made the piece. In the aftermath of the repression of the Solidarity Trade Union in December 1981, Police sirens were heard constantly in Poland. In this light, his gestures – turning away from the spotlight or moving his arms as if running – come to seem pathetic, perhaps unintentionally so. Here, the inescapable and tragic context of crisis forced drama, expression, drama and psychology into the work. Nam June Paik. Videa ‘n Videology 1959–1973 (Emerson Museum of Art, Syracuse, New York, 1974) p. 55. H. M. Enzensberger, ‘Constituents of a Theory of the Media’ in New Left Review, 64 (November/December 1970) p. 15. Nam Jun Paik interviewed in Radical Software, vol. 1, n. 2 (1970) p. 25. Michael Shamberg/ Raindance Corporation, Guerrilla Television (New York: Holt, Rinehart and Winston, 1971). Bruszewski cited in Zagrodski, Wojciech Bruszewski. Fenomeny percepcji, p. 150. Robakowski cited by Ryszard Kluszczyński, ed., Warsztat Formy Filmowej (Warsaw: Centrum Sztuki Współczesnej Zamek Ujazdowski, 2000), p. 71.